Inc Solutions Managed – Enterprise Hotspot is a package for mid sized premises wishing to provide Internet access to public areas as well as a small number of rooms. The equipment consists of our own designed, industrial grade gateway and includes four industrial grade access points from leading manufacturers such as Cisco, Proxim, Mikrotik or Ubiquiti. Supplied complete with a high performance router and all networking infrastructure including a non managed switch. 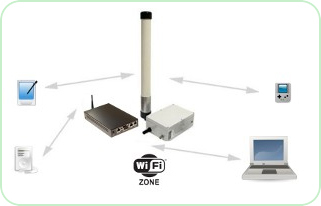 With this system you can also provide internet access via a wired connection for those customers who require a network or cable connection. The Inc Solutions Managed – Enterprise Hotspot may be extended by simply adding additional access points for greater coverage in your premises. For best coverage in your business we recommend that the Enterprise package is professionally installed by one of our certified contractors. Your HotSpot will be operational in minimal time ready to offer high-speed wireless access to your customers and generate you revenue. 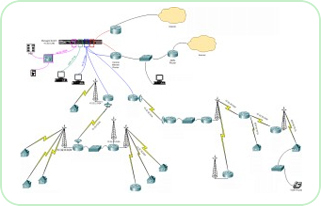 Our Enterprise solution can also support VLANs and Multiple SSIDs. This is very useful if you would like employees to have secure access to the company network wirelessly as well as providing a public hotspot to your customers. Inc Solutions Managed – Enterprise Hotspot is supplied with everything you need to start selling access as soon as your system is installed and activated. Subscribers are blocked from viewing other computers connected to the system and are limited to the bandwidth associated with the voucher ensuring no user abuses the connection. With our own designed controller you are able to add as many access points as you need to cover medium to large areas. Inc Solutions Managed – Enterprise Hotspot is a comprehensive tailor made package where all tariffs, roaming, portal design are agreed with you so that we can match your precise requirements. Fully branded to the look and feel of your premises. Coverage from the included four access points will cater for large areas and can be easily extended as required. Inc Solutions Managed – Enterprise Hotspot is added to our Network Operations Centre remote monitoring program, which means that we know when there is a problem with your system, sometimes even before you do. In the event of a system alarm our engineers can log in remotely to diagnose and repair the problem. We can even provide you with system uptime reports so you know just how reliable our systems are! Inc Solutions Managed – Enterprise Hotspot returns a high rate of revenue to your business, far in excess of other Hotspot providers. When you need more vouchers simply access your customer page on our web site and order them and we will deliver them to you. Simple, secure and cost effective, Inc Solutions Managed – Enterprise Hotspot is the easiest way of creating a HotSpot in your business.